Hello! 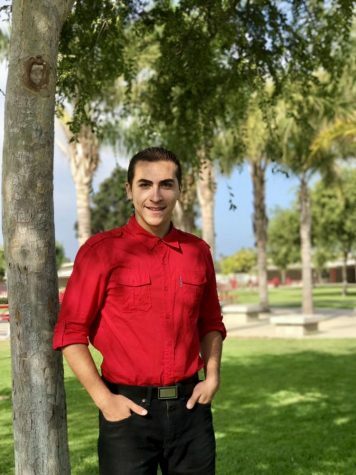 I am Miguel Angel Guzman, a contributor in the Newspaper class at Hueneme High School. I am now a senior this year, meaning that this will be my last year with the viking family. I am definitely looking forward to this year and completing it successfully, in hopes of obtaining excellent opportunities that will aid me in my future life. Anyways, I will let you know a bit about myself. Everyone recognizes me as that energetic mariachi guy that sings and dances. "How do you do it?" some ask. I am not completely sure, but it just comes out when I get up on the stage. If anything, I remember I was nothing like that at all before I joined mariachi. When I was younger, I remember I would go to my siblings' band concerts. I would always be bored at them. I didn't understand music at all and why people enjoyed it. I didn't even listen to the popular songs that would play on the radio. All the words just sounded distorted and I didn't understand anything. However, one day I wondered how it would be to play an instrument. All of my siblings were in the school band, so I felt like I also needed to be in it. I made the decision that I was going to play the trumpet and because of that decision, many doors opened. Along the way, I learned to play a bit of piano on my sister's keyboard. I got to high school and I continued music by being in the Marching Band and playing the bass guitar in the Jazz Band. Once Sophomore Year came, everything changed. I joined the school mariachi, a church choir, and even a private mariachi outside of school. All these things led me to where I stand today. Why do I like mariachi so much? For several reasons: becoming a better musician, inspiring children and teenagers, putting smiles on people's faces, and because it's part of my culture. That feeling that you get when you're on stage or when you're finally going to sing...it's just an amazing feeling and I wish that everyone can experience the way that feels. Currently, I live with my whole family: my parents, two sisters, and brother. I am the youngest out of the four siblings. I am a huge Star Wars fan and I'll watch any of the movies again and again. In addition, I've participated in the OUHSD Law Enforcement Academy and I even went on to do the Police Explorer Academy. Even when things get really hectic or your plate gets really full, never lose hope and never give up on what you do best. I'm grateful to have my family and friends supporting me all the way. I will make sure to do the most that I can as a contributor. Thank you for taking your time to read this.